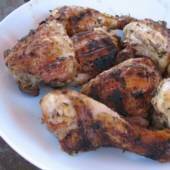 This is a delicious and easy recipe for chicken on the grill, in the fireplace, or under the broiler. It can be made with a whole cut-up chicken, or just the parts of your choice. Here it’s made with chicken thighs and legs. Combine thyme, garlic, olive oil, lemon juice, and salt in a small bowl and mix well. 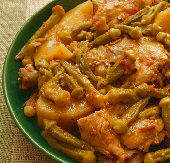 Place chicken in a pan and spoon the mixture over, then use hands or basting brush to coat the chicken, top and bottom. Cover and refrigerate for 30 minutes to 2 or 3 hours. Brush grill or grate with olive oil and grill over high heat for about 9-10 minutes on each side for cutup parts, about 15 minutes each side for whole quarters. If there’s any marinade left in the pan, brush over chicken while grilling.